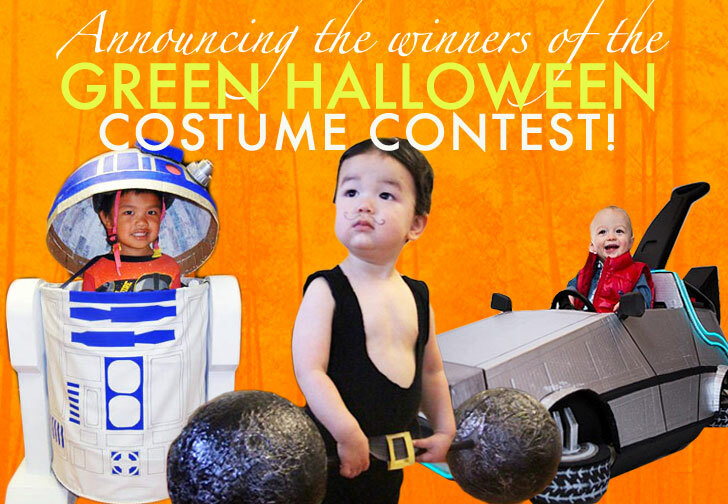 Announcing the Inhabitots 2012 Green Halloween Costume Contest Winners! Drumroll please! We're delighted to announce the winners of Inhabitots Green Halloween™ Costume Contest! All of your DIY creativity really brought a smile to our faces this year, and we thank each and every one of our finalists for taking the time to share the photos and stories behind their adorably clad kiddo's costumes! Among the impressive designs were a whipped cream topped strawberry frappuccino, a feathery, cage-free chick, a super sweet candy vending machine and even a walking and talking haunted house! While we think each and every costumed cutie who entered our contest is a winner, ultimately, the decision of who will take home the prizes and accolades came down to your votes. Now the results are in, and without further adieu, we present to you the winners of Inhabitots 2012 Green Halloween™ Costume Contest! Lo and behold, a tiny Circus Strong Man put a stronghold on our voters! 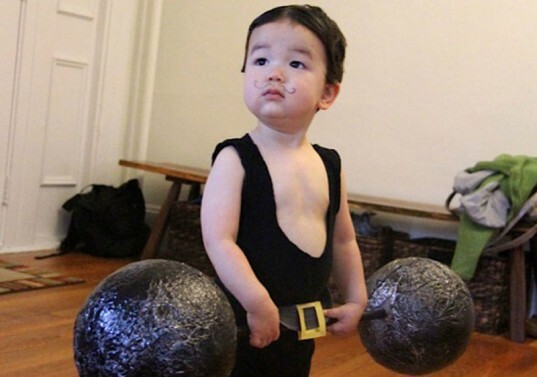 This little man’s mom, Marion Min-Barron, created a circus-themed Halloween for her family, and she dressed-up her 19 month-old son as an old-school circus strong man! The resourceful mama made a few tweaks to an old onesie, fashioned a homemade belt from elastic and construction paper and made a hefty-looking barbell by spray painting two bouncy balls and attaching them to a wooden dowel. She let her adorable son practice his weight-lifting motions in the days leading up to Halloween, and he looks like a real pro in this pic. Of course, the curly moustache drawn on with eyeliner really tops the ensemble off, making this costume the winner of the heavyweight grand prize title. Littlest Marty McFly and his DeLorean push-car really captured the hearts of our editors, and he made us all nostalgic for those simpler times when Back to the Future was made. This cool little dude wins our Editor’s Choice award. Who could resist that smile… and that car! Cory Newton-Smith used a push-car outfitted with a cardboard frame fashioned from photos of the famous vehicle to make this DeLorean replica! Krystal’s daughter’s nickname is Super Fi and for months she had been talking about dressing up as a superhero for Halloween. They didn’t want to buy a costume this year, so Krystal was happy to come up with an outfit using items they already owned. They ended up with a fun costume made from leftover felt, embroidery thread, tulle and ribbon from past projects, an old sweatshirt and pants, Starbucks coffee sleeves, and temporarily altering her winter boots. The result was Super Frugal and super fun! The R2D2 costume Jimmy made for his son is entirely homemade. 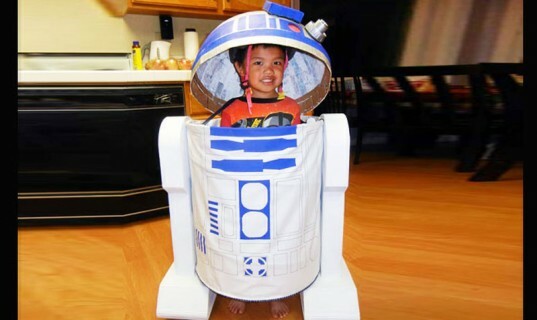 He tried to make it as comfortable and practical for trick-or-treating as possible while staying as realistic and true to the original R2D2 design. The dome is a helmet that his son wears so he can see when walking, but it can fit on top of the body to go into full disguise mode. The legs have wheels for assisted movement, and lights and sound effects complete the wow-worthy costume. Almost all materials were reused from things around their home. 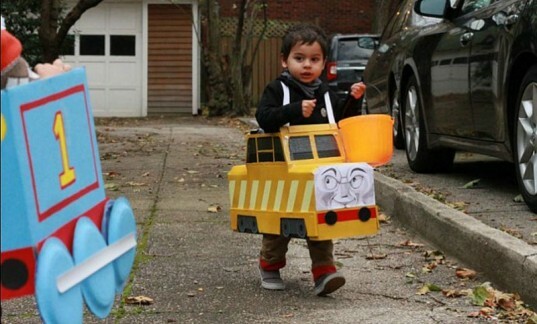 Emma’s husband created these two characters from “Thomas the Tank Engine’” for him and their almost-3-year-old son, Egon, to wear for Halloween. All homemade, from cardboard boxes, sculpted into crane arms, wheels and even moving mechanisms! They did an amazing job, and they all had an awesome Halloween in their hurricane-swept Brooklyn neighborhood! We were all bowled over by this clever culinary costume! To cook up this getup, this family got crafty. They used yarn for the spaghetti noodles, felt balls for the meatballs, adhered them to a red outfit that doubled as tomato sauce and topped it off with a bowl from their kitchen cupboard. Talk about a winning recipe! 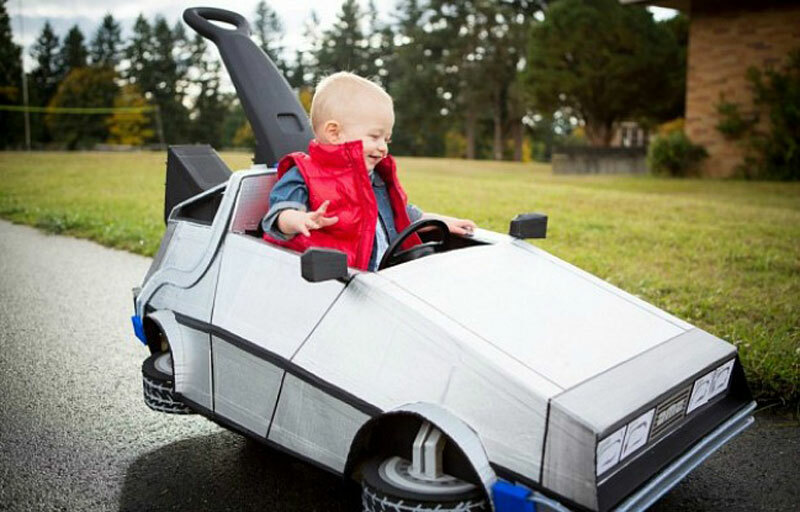 Congratz to lil' circus strongman but as a geek, I have to say that mini Marty McFly in his Delorean was my fave. Congrats to all the winners! There were some amazing costumes this year! looks like this was more of a contest for parents, not kids. My brother and I each made our costumes. GRAND PRIZE WINNER: CIRCUS STRONG MAN Lo and behold, a tiny Circus Strong Man put a stronghold on our voters! This little man's mom, Marion Min-Barron, created a circus-themed Halloween for her family, and she dressed-up her 19 month-old son as an old-school circus strong man! The resourceful mama made a few tweaks to an old onesie, fashioned a homemade belt from elastic and construction paper and made a hefty-looking barbell by spray painting two bouncy balls and attaching them to a wooden dowel. She let her adorable son practice his weight-lifting motions in the days leading up to Halloween, and he looks like a real pro in this pic. Of course, the curly moustache drawn on with eyeliner really tops the ensemble off, making this costume the winner of the heavyweight grand prize title. Littlest Marty McFly and his DeLorean push-car really captured the hearts of our editors, and he made us all nostalgic for those simpler times when Back to the Future was made. This cool little dude wins our Editor's Choice award. Who could resist that smile... and that car! Cory Newton-Smith used a push-car outfitted with a cardboard frame fashioned from photos of the famous vehicle to make this DeLorean replica! 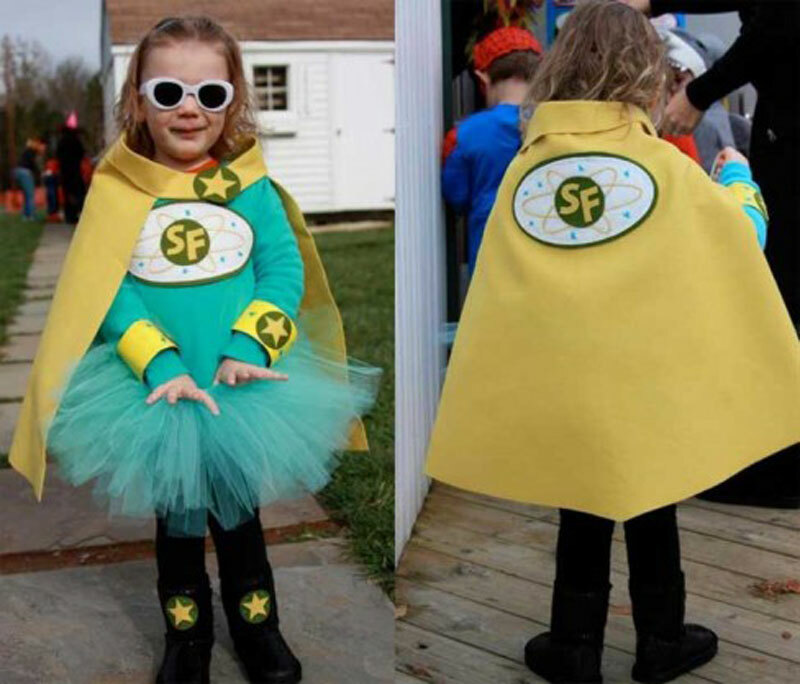 SUPER FRUGAL DIY SUPERHERO Krystal’s daughter’s nickname is Super Fi and for months she had been talking about dressing up as a superhero for Halloween. They didn’t want to buy a costume this year, so Krystal was happy to come up with an outfit using items they already owned. They ended up with a fun costume made from leftover felt, embroidery thread, tulle and ribbon from past projects, an old sweatshirt and pants, Starbucks coffee sleeves, and temporarily altering her winter boots. The result was Super Frugal and super fun! RUNNER-UP: HOMEMADE R2D2 The R2D2 costume Jimmy made for his son is entirely homemade. He tried to make it as comfortable and practical for trick-or-treating as possible while staying as realistic and true to the original R2D2 design. The dome is a helmet that his son wears so he can see when walking, but it can fit on top of the body to go into full disguise mode. The legs have wheels for assisted movement, and lights and sound effects complete the wow-worthy costume. Almost all materials were reused from things around their home. CRANKY THE CRANE AND DIESEL 10 Emma’s husband created these two characters from “Thomas the Tank Engine’” for him and their almost-3-year-old son, Egon, to wear for Halloween. All homemade, from cardboard boxes, sculpted into crane arms, wheels and even moving mechanisms! They did an amazing job, and they all had an awesome Halloween in their hurricane-swept Brooklyn neighborhood! SPAGHETTI AND MEATBALLS We were all bowled over by this clever culinary costume! To cook up this getup, this family got crafty. 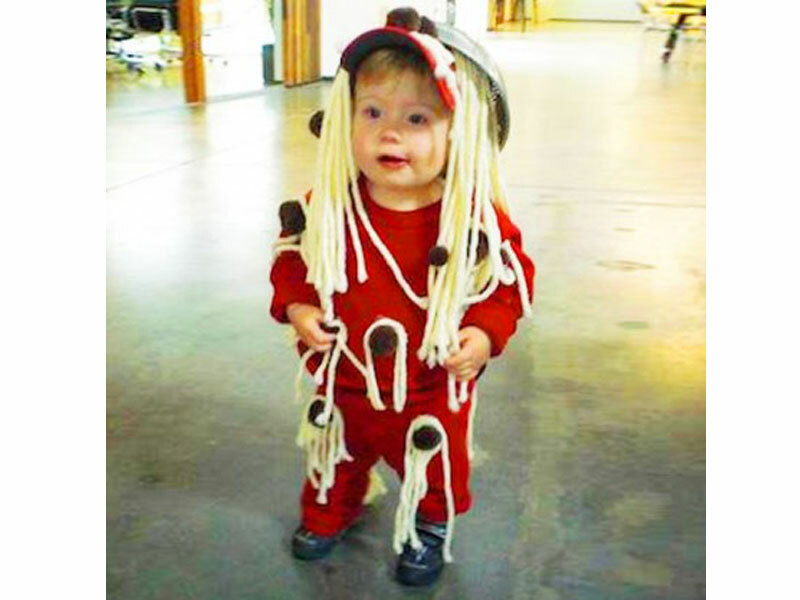 They used yarn for the spaghetti noodles, felt balls for the meatballs, adhered them to a red outfit that doubled as tomato sauce and topped it off with a bowl from their kitchen cupboard. Talk about a winning recipe!